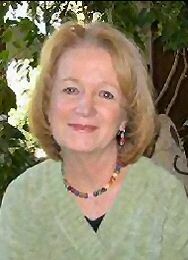 Kansas mystery author Nancy Pickard has created a twisted and tangled world of deception through sixteen modern day novels and the detailed developemnt of several enticing characters, her latest work being The Virgin of Small Plains. Mrs. Pickard resides in Prairie Village, Kansas, and spends a great deal of time traveling between Florida and her home. A multitde of her short stories have recieved recognition including th Agatha, Anthony, Macavity, and Shamus awards for her short stories and the Agatha, Anthony, and Macavity awards for her novels. The Los Angeles Times says, “Pickard pushes at the presumed limits of (crime fiction).” The San Diego Union says, “Nancy Pickard is acclaimed as one of today's best mystery writers. The following page is an informative dedication to the works of Nancy Pickard, designed with the intent of honoring and generating interest in yet another wonderful Kansas author. See Nancy Pickard on Wikipedia. We were almost the only traffic on the two-lane highway going west toward the Crossbones Ranch. But whenever we did pass somebody driving east, Slight and the other driver would raise their right index fingers off their steering wheels in a kind of salute. Sometimes, they nodded as well. Once a man driving a tractor-trailer rig waved with his whole arm-clearly a demonstrative type, probably cried at funerals. Abby Reynolds braked her truck on the icy highway, startled by what she imagined she saw off to the side of the road. That can’t be, she thought, as she squinted into the snow, trying to see more clearly. When the wind blew an opening in the blizzard, Abby realized that it was not a hallucination. It was not an impossible illusion sketched on the early morning air by the gusting snow. It was . . . good grief! . . . it was Nadine Newquist in a bathrobe, surrounded by swirling white, struggling through drifts on the old cemetery road, as if she were determined to visit a particular grave on this particular morning. My God! It was Nadine: the judge’s wife, Mitch’s mom, Abby’s own late mother’s lifelong friend. It really was Nadine, a woman who was sixty-three years old and speeding toward early Alzheimer’s at about the same rate that Abby’s pickup truck was sliding sideways on Highway 177. What the hell was Nadine doing out there? She was all by herself, in a bathrobe, for God’s sake, in a blizzard . . .
Abby pumped her brakes with a light touch of her foot, didn't’t slam on them like a fool, but her truck started to spin anyway, going round and round on the two-lane blacktop like a two-ton skater on ice. She let her steering wheel alone, waiting for it to stop spinning before she touched it again. Coffee sloshed out of her lidless thermal cup in its holder by her knee; the smell of it filled the cab of her truck. She could still taste her last sip of it, along with the fruit and cereal she’d had for breakfast—all of which was now threatening to come back up her throat. 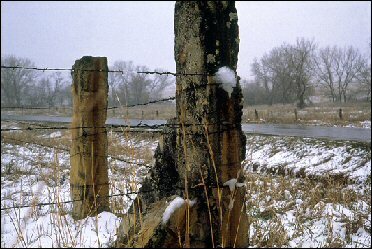 “Small Plains”: Fictional location in Kansas that propagates the story line and conflict in Virgin of Small Plains. The actual location is Alta Vista. 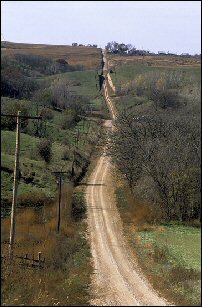 “Hood County”: Fictional county in Kansas that appears in Nancy Pickards' novel Bum Steer. The actual location is Wabaunsee County.